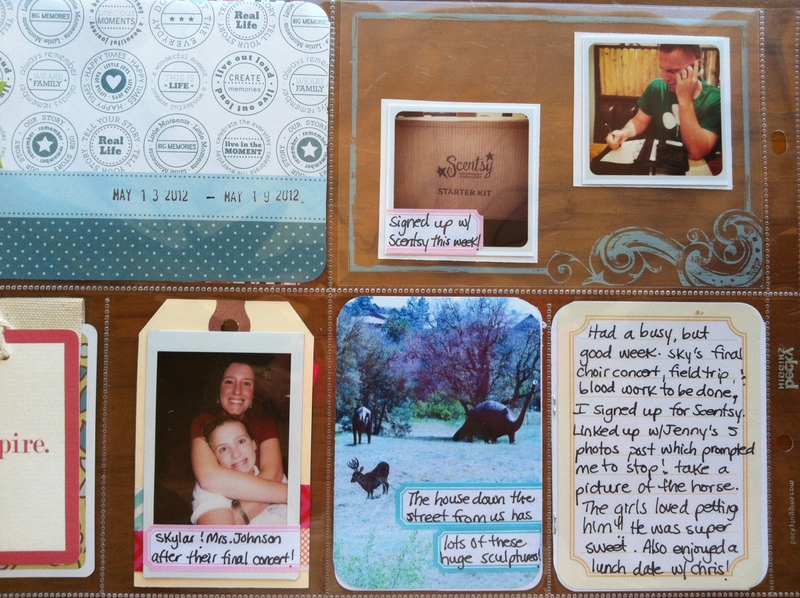 Project Life: Week 20 | I am JuJu! ← Sharing Our Story In 5 Photos & A Friday Morning Funny! Well hello there! I’ve been a bit absent from my blog for the past 2 weeks. Lots of life happening. I had the wonderful opportunity to travel to Tucson last week to see my cousins graduate from high school so I did not post Project Life last Tuesday. Today I will be sharing Week 20 with you and originally I had planned to share week 21 as well, but I have a lot of pictures and didn’t want to feel rushed in getting that layout together. I am thoroughly enjoying documenting our story this way. Twenty weeks in and I still LOVE it! Below is a shot of the layout, not including the insert I included of Skylar’s field trip to the Musical Instrument Museum. 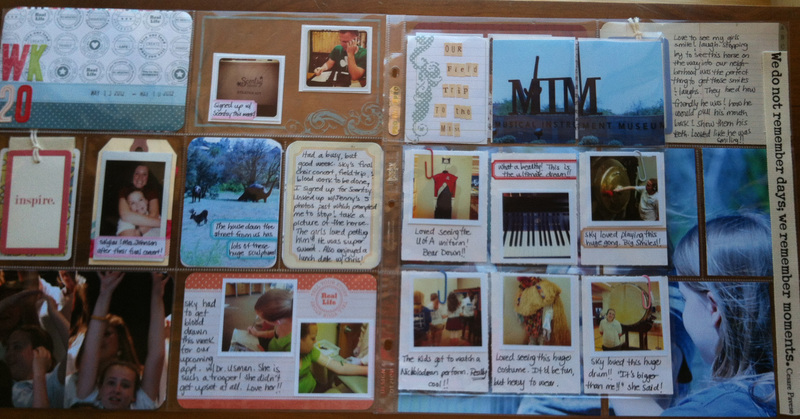 I continue to love using Martha Stewart labels to add journaling to my pictures. This week also had a great mix of instagram, iPhone, instax polaroid, and pictures with my dslr camera. I included an enlarged picture that spreads over the page this week. I’ve done this several times before and I just love the way it looks! Here’s a close-up of the enlarged photo. I just love how Skylar is talking to the horse in this shot! 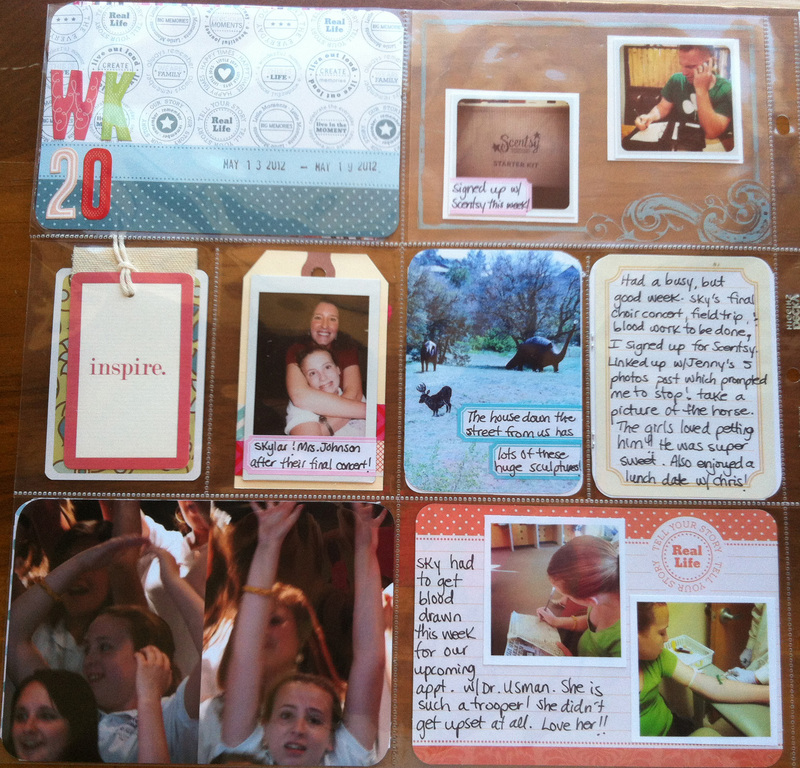 I participated in a photo link-up on my sister’s blog last week. 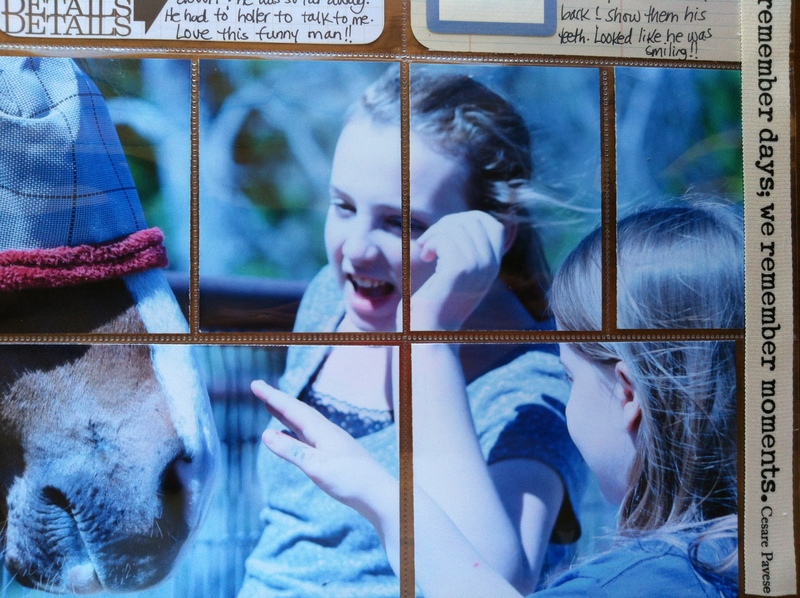 The photo of the girls with the horse was from a prompt in that photo challenge. We pass this horse every day on the way out of our neighborhood. After living in Prescott for a year, we finally stopped to pet the horse and take a picture. You can read that post HERE! 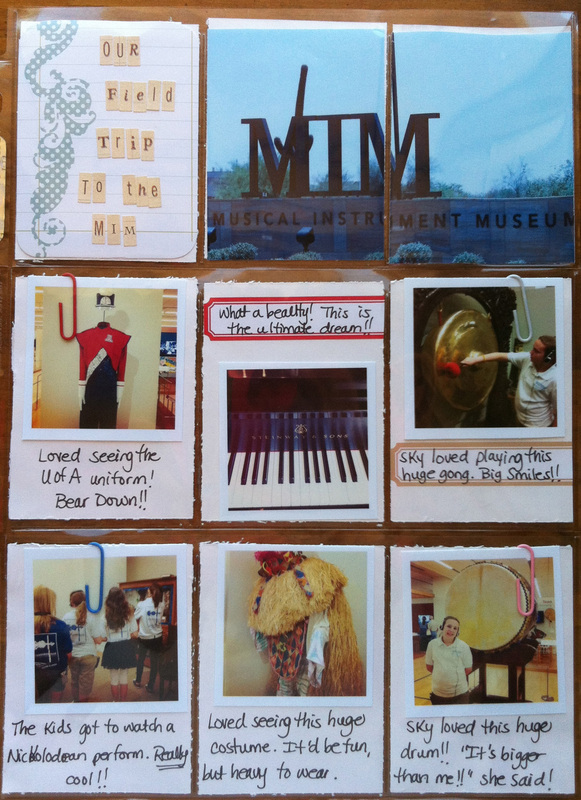 I also included a baseball card page protector with the pictures from our field trip to the Musical Instrument Museum. It was really neat! 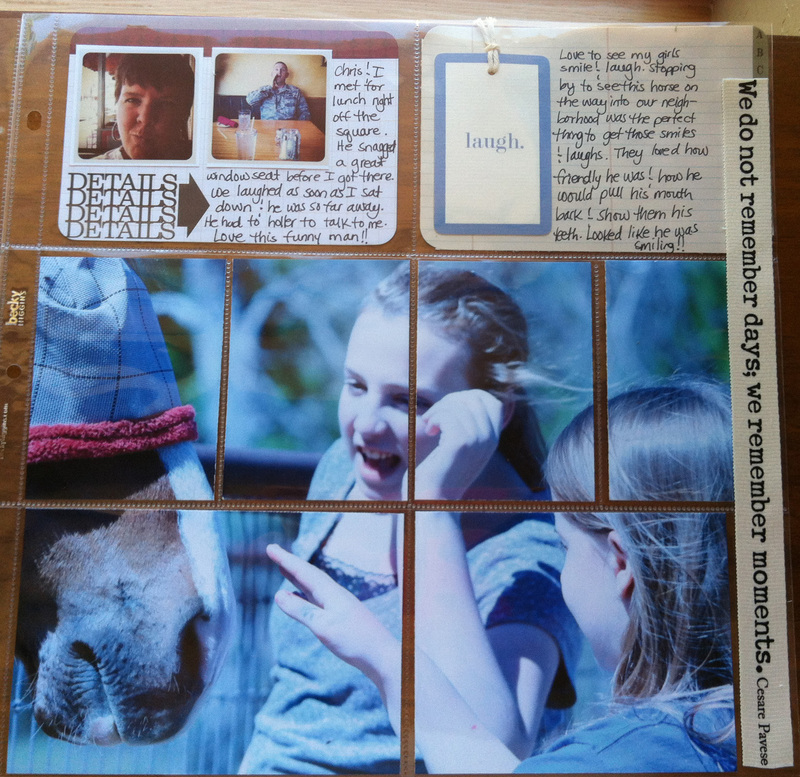 Here’s a shot of the entire layout including the insert. Thanks for stopping by to see my pages. I am linking up with The Mom Creative today! 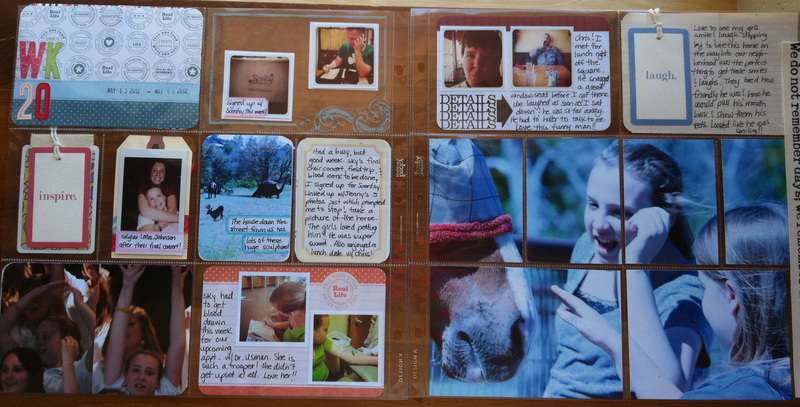 Make sure you head over there and see all the wonderful project life inspiration. This entry was tagged project life, project life week 20. Bookmark the permalink. Great pages Julie. That enlarged photo is stunning! Thank you! It is definitely one of my favorite things to do. Love your pages! That insert turned out so well…have to remember that idea. I ♥ the idea of using a big picture to fill multiple spots. I just haven’t been brave enough to try it yet, plus I don’t print from home so I don’t know where to get one printed. I like your enlarged photo, came out great. How fun to be with the horses, they are my favorite animal. The different size photos all look cool, you did a great job getting them all in and telling the stories. I really like that large picture you devided up into all those different pockets. Looks like a cool museum to visit too. I really love this project tool as well. I absolutely love the overlay with the Scentys picture on it! I just love the enlargement across several spaces!